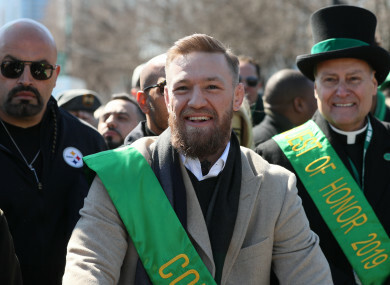 McGregor recently joined the St Patrick's Day parade in Chicago. MIXED MARTIAL ARTS star Conor McGregor announced this morning that he had retired from the sport, vowing to hang up his gloves for the second time in three years. The Irish UFC star wrote on Twitter that he had decided to call time on his career inside the octagon. The Dubliner had previously vowed to retire in 2016 in a move that was widely seen as a negotiating gambit. McGregor’s decision comes after a troubled few weeks for the fighter. Email “Conor McGregor announces his retirement from MMA”. Feedback on “Conor McGregor announces his retirement from MMA”.